One of the many duties of merchandising managers is to summarize meaningful product and/or category information collected at the sometimes thousands of retail stores for which they are responsible. 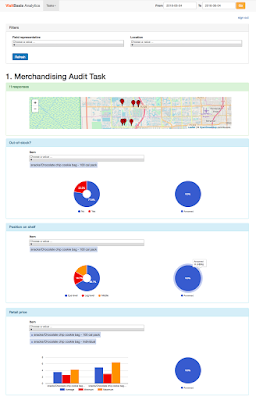 Merchandising reports can seem complex to build but, with the right piece of software, merchandising and category managers can easily organize multiple store data in a way that will lead to the appropriate action by management. This is the probably the most important type of merchandising reports since it shows any out-of-stocks by stores and therefore allows management not only to know which locations need extra shipments but also to better adjust shipment quantities and frequency. This type of report can include information on issues such as product damage and/or tampering, as well as photos. As the name indicates, this type of report can help merchandising managers view and analyze product price fluctuations by store. This merchandising report example includes planogram compliance reports and can contain share of shelf percentages as well as category shelf photos. Viewing and analyzing competing product information allows merchandising managers to tweak their product/category strategy. Information may include pricing, promotions, packaging, and display strategy. Seasonal displays are a great way to increase product awareness at stores. With this report, merchandising managers can keep track of the set-up, maintenance, and performance of seasonal displays. This merchandising report example allows managers at CPG companies and marketing agencies to keep track of how many and which stores each merchandiser is visiting a day, as well as know if they are properly performing their duties with GPS verification of store visits. VisitBasis is an end-to-end merchandising solution that allows managers to create the customized questionnaires necessary to capture store-level data in order to generate the above merchandising report examples - and more. See what VisitBasis can do for your business: Sign up for a free trial or schedule an online demo.